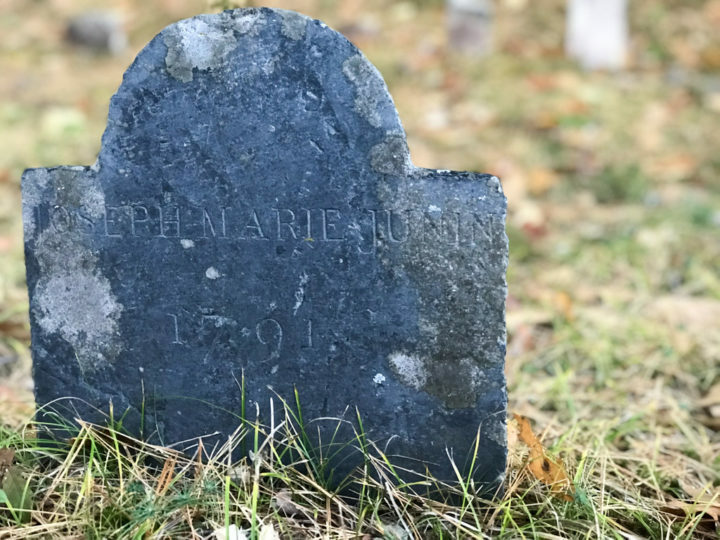 The grave of Joseph Marie Junin, who died in 1791 at age 32, reportedly murdered in his home, then cursed to seek vengeance on his murderer, who escaped justice. Junin is thought to be the oldest internment in Mount Hope Cemetery in Bangor. He actually has two gravestones, one in front of the other. 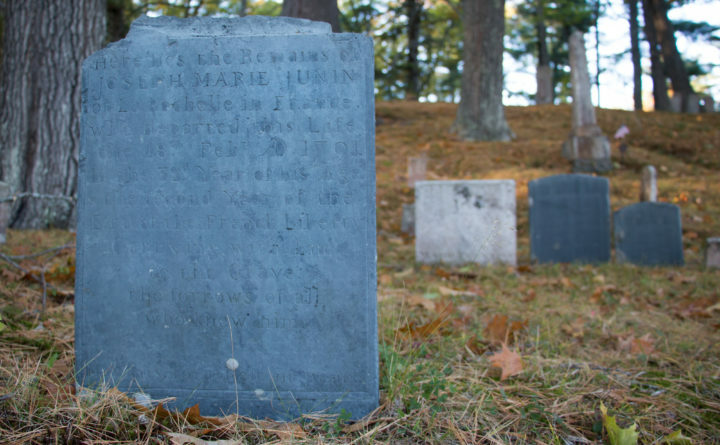 It was a frigid night in February 1791, when Joseph Junin died. A fur trader from a settlement on the Penobscot River, Junin was found on the floor of his home with a gunshot wound in the head, surrounded by luxurious furs, or so the story goes. His death is a story of mystery, vengeance, curses and resurrection. 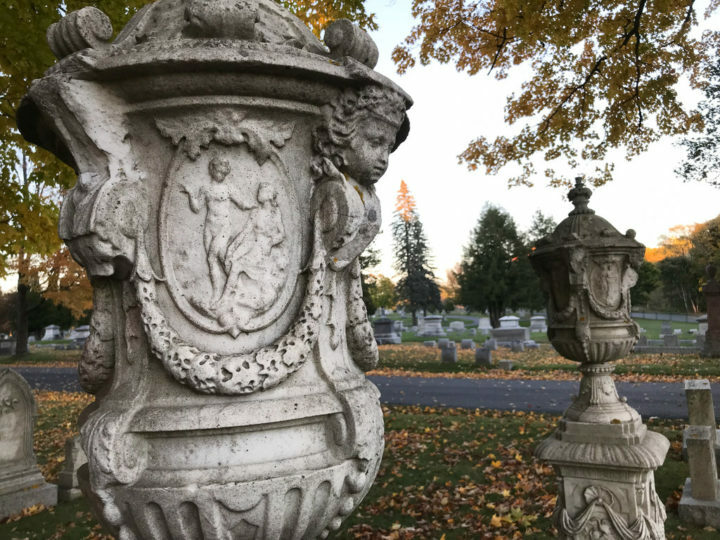 It’s also one of the highlights of the Bangor Historical Society walking tour “The Darker Side of Mount Hope Cemetery,” hosted multiple times each Halloween season. “Junin was a great trader with the Penobscots [a native tribe in the area] and had a very good working relationship with them,” said Matt Bishop, who is the curator for the Bangor Historical Society and leads many of the society’s walking history and ghost tours. By now, Bishop knows the story by heart. Preserved in historical documents and memoirs, the tale of Junin’s death is thought to be the first recorded murder in what is now Bangor. It starts with Junin’s nephew, Louis Paronneau, waking his neighbors by pounding on their door in a frantic state, pleading for help. He claimed the Penobscots were coming to kill his uncle, but the neighbors weren’t convinced. They tried to calm the young man, but he ran off into the night. A little while later, they heard gunfire. One of the many hills of Mount Hope Cemetery in Bangor. An investigation followed, as Bishop tells it, but they could find no evidence of Penobscots visiting Junin that night. In fact, the only footprints in the snow they found were prints belonging to the nephew, who lived with Junin at the time. Paronneau then became the prime suspect, was charged with murder, went to trial in July and was acquitted of all charges. But during the ghost tours in the cemetery, the part of the story Bishop focuses on is the curse. 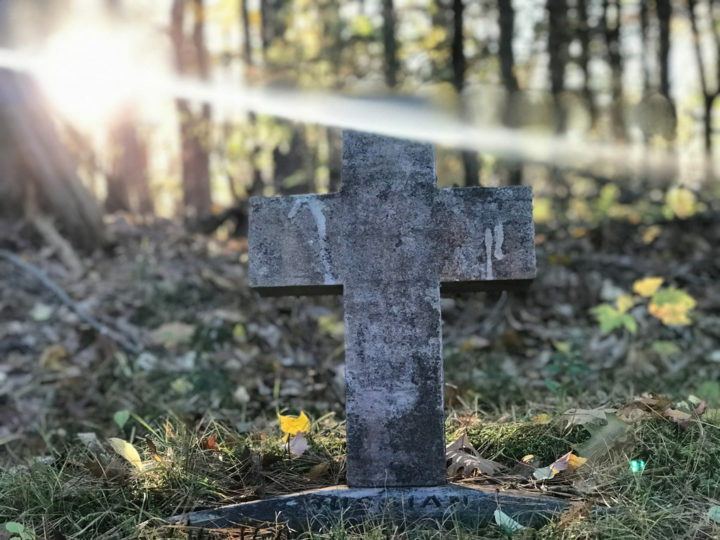 Sunlight filters through the trees behind an old gravestone in Mount Hope Cemetery in Bangor. “They believe at his burial that some of the local Penobscots, the local medicine women and the elders, put a curse onto his body so he would seek out the person who wronged him,” Bishop said. Junin was buried in a small cemetery near his home. 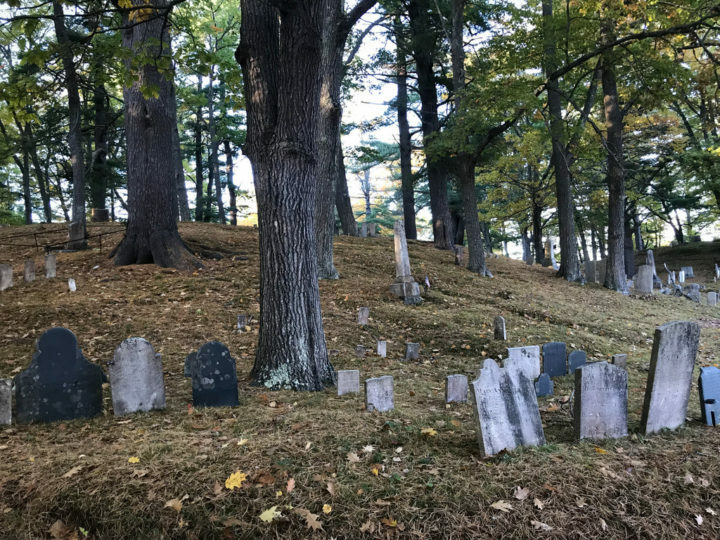 But after the larger, grander Mount Hope Cemetery opened in 1831 in the southeast corner of Bangor, Junin’s coffin was unearthed and re-interred there, not far from the cemetery superintendent’s house. Some of the monuments in Mount Hope Cemetery in Bangor are elaborate and contain a lot of symbolism. To do this, they added a phrase to the bottom of his new gravestone, Bishop said. 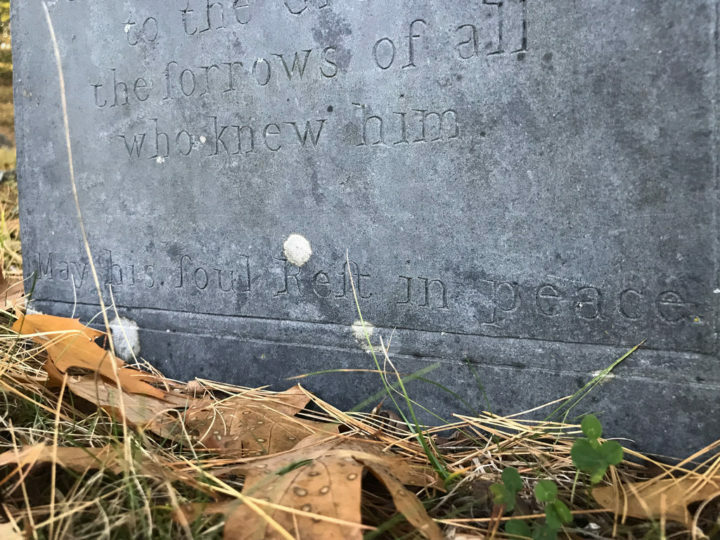 Junin’s story is one of many spooky stories shared during the Bangor Historical Society’s “The Darker Side of Mount Hope” walking tour, which is planned for 7 to 9 p.m. on Oct. 23 and Oct. 30. The tour costs $10, and the tickets can be purchased at http://www.bangorhistoricalsociety.org. The historical society also hosts several weekly ghost tours in downtown Bangor throughout the month of December. For more information, call 207-942-1900.